Just so that you can see them, we've put together the latest rendering of Stillwell Avenue and Surf Avenue looking toward the Coney Island Boardwalk with the one released in November. 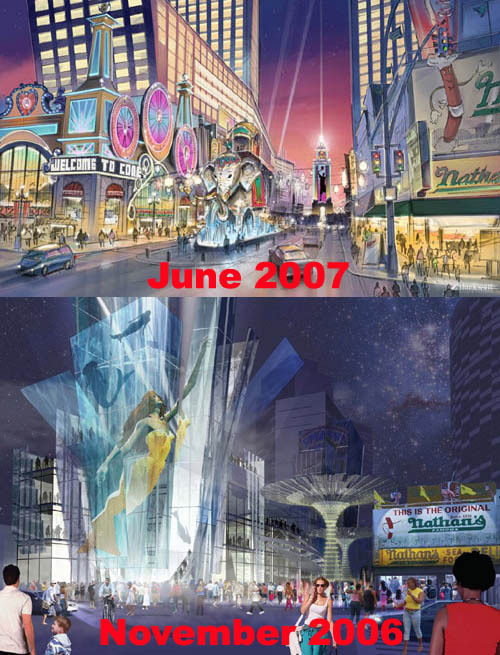 Note that the glassy building with the mermaid in v 2.1 has been replaced with a building meant to evoke Luna Park. Also note the tower at the end of Stillwell Avenue, meant to evoke a tower that once stood in another Coney Amusement park, Dreamland. The elephant in v 2.2 evokes an old Coney structure called Colossus (and Lucy the Elephant in Margate, NJ). Whereas the tall buildings in v 2.1 sort of faded into the background, there's no attempt to hide the tall ones in 2.2. We're also happy to report that those Parachute Jump looking things that have appeared in a number of past renderings are finally gone.